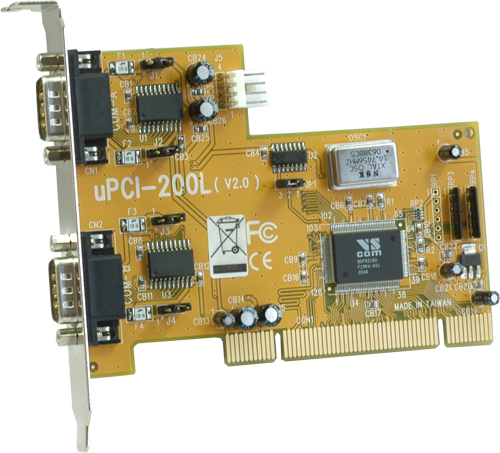 Vision Systems' latest Universal PCI serial card supports external devices with +5V and +12V DC power supply - VSCom 200L UPCI Power. November 22, 2006 - Vision Systems GmbH provides power over the serial port. Modern computers often do not provide a serial port. Even when such a port is available, the Line Drivers for RS232 do not provide excessive power. Older port-powered devices may fail to operate. Further there is a demand to have devices equipped with only one cable to the computer. Devices like serial controlled displays, barcode scanners, RFID readers, and more have a comparably high power demand. A classical serial port offers +12V DC with at most 5mA available current. To prevent those limitations the new VScom 200L UPCI Power card provides +5V DC and +12V DC over the serial connector. The current is up to 1000 mA, which will fulfill the demands of a wide range of devices. The user has full freedom of configuration, the pins used for power supply can either transport the RS232 signal, or power to the device. Further the power may be drawn out of the PCI slot, or alternatively provided by an FDD connector directly from the PC power supply. As all the other products of the UPCI series, the VScom 200L UPCI Power will operate in the classical 5V PCI slot, as well as in the reduced power 3.3V PCI environment. The power supply of +5V is also available in a 3.3V slot, so drawing power from PCI is still usable in most recent mainboards. Detail Specification | Inquiry this product: Art No (4477).